DISCLAIMER: Empire Ears provided me with a discounted price on the Phantom in return for my honest opinion. I am not personally affiliated with the company in any way, nor do I receive any monetary rewards for a positive evaluation. I’d like to thank Empire Ears for their kindness and support. The review is as follows. Empire Ears are on their way to becoming a household name. The family-run enterprise – formerly known as EarWerkz – have been putting out hits for years, including the venerable Legend-R average_joe reviewed in 2015. But, they’ve only recently broken into the mainstream with their statement piece behemoth; the 14-driver, switch-clad Zeus-XR. 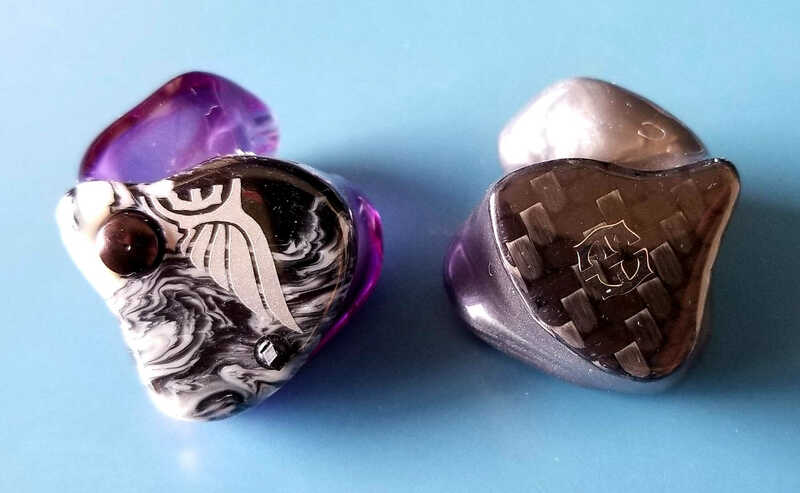 Looking to ride that momentum into the proverbial sunset, Empire Ears have taken 2018 by storm, putting out two brand new lines of in-ears tuned with a think-tank-like collective of industry pros. 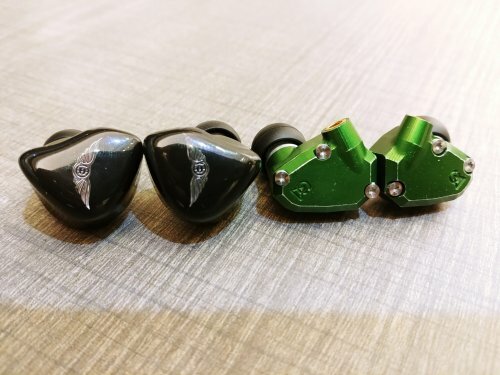 Headlining the EP (Empire Professional) line is the Phantom: A revelation in tonal transparency; one of the most natural, sophisticated and refined in-ears I’ve ever heard. Among the myriad of in-ears I’ve reviewed over the past year, Empire Ears clearly have the best-packaged ones of them all. 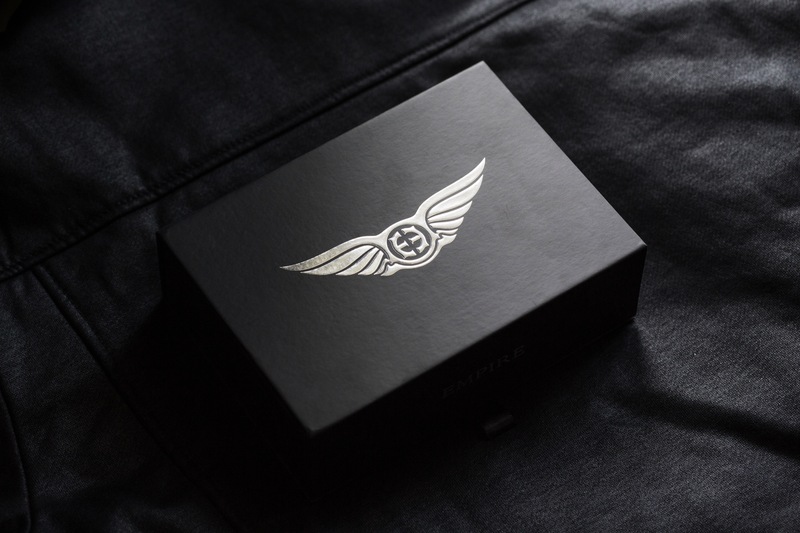 The Phantom comes in an uber classy, onyx black box – complete with the company’s Bentley-like logo glimmering on top and a magnetic strip lining the latch below. Lifting the lid reveals a quick start guide, small and large fabric pouches, a branded micro-fibre cloth and Empire Ears’ personalised Aegis case. Within the case are the in-ears themselves, the default Effect Audio Ares II cable and an included cleaning tool securely set within foam cut-outs. Although I wouldn’t mind replacing one of the pouches for a mini semi-hard case, this is surely a package as complete as I’ve ever seen one. The provided Aegis case is a touring musician’s dream. A black, fine-textured finish shrouds the enclosure, topped with an engraved, aluminium faceplate and two tenaciously robust clasps. Density and weight throughout the vault suggests a great degree of durability, without sacrificing look or feel. The one complaint I’ve heard online is the narrow profile, which may inadvertently cause pressure on the in-ear monitors when mispositioned. A face-down seating position is required. But overall, Empire Ears’ Aegis case possesses a suaveness that all but telegraphs the quality sitting within. When customising your Empire Ears custom in-ear monitor, you’re given the option of 29 shell colours (21 standard and 8 glitter) and a whopping 62 faceplates. The latter consists of the 29 colours that are available in shell form, in addition to multi-coloured swirls, wood, carbon fibre and multi-coloured graphics – almost like vinyl on a race car. On top of that, you’re also given the option of adding Empire Ears’ logo in gold or silver, a field of Swarovski crystals or your own custom artwork that you can submit on their online designer. 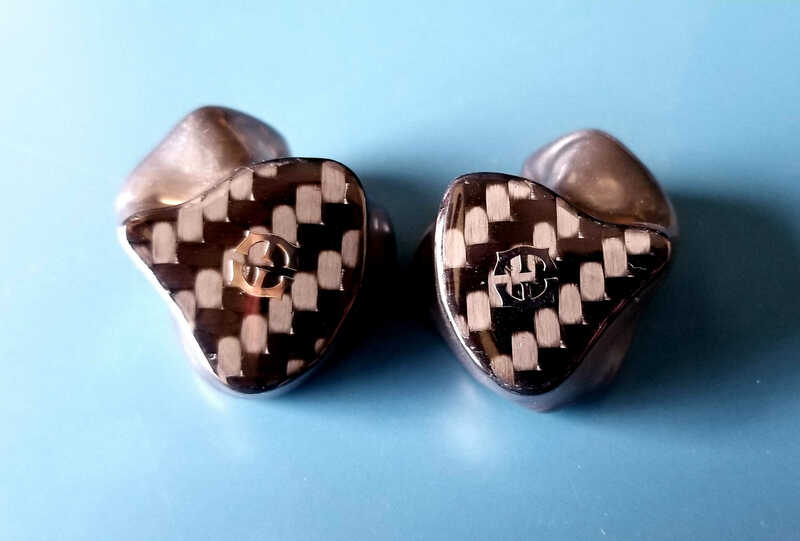 Although the tool isn’t as sophisticated as JHAudio’s (which allows the user to rotate the designs in a 3D space), it’s on an equal plane as those from 64Audio, Custom Art and Vision Ears. In terms of build, cosmetics, comfort and isolation, the Phantom ticks all boxes with ease. 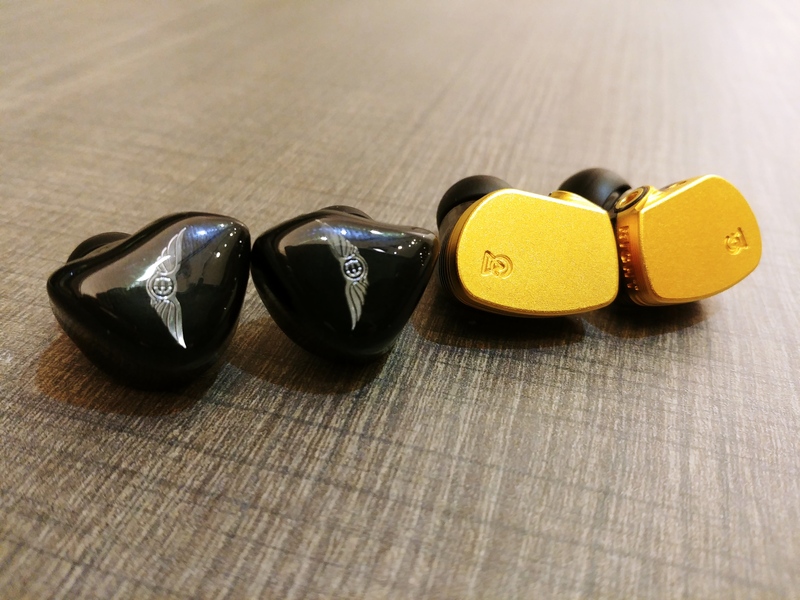 My personal pair came in onyx black with carbon fibre faceplates and gold emblems; emulating the class and luxury a high-end in-ear monitor should. And, nowhere is that more clearly reflected (besides in sound, of course) than in finish. The monitors are evenly and illustriously lacquered with neither a bubble nor a rough edge in sight. Even the horn bores – notoriously difficult areas to get clean – are flawlessly structured with utmost finesse. In the ear, they’re vanishingly comfortable – balancing pressure and ergonomics better than a large majority of my collection – and they isolate very sufficiently as well. Finally, as mentioned, Empire Ears includes Effect Audio’s acclaimed Ares II wire as the in-ear’s stock cable. Relative to other Effect Audio cables I’ve owned, the braiding isn’t as uniform and silky – probably so because the’ve had to keep up with massive demand. But, they still exude infinitely more quality than most stock options in the industry today. synX is a proprietary crossover system developed in-house by Empire Ears, which they claim designates more individual audio bands per driver than any other crossover technology currently in existence. In essence, it splits the load across more transducers, so that they possess more headroom and – therefore – lower distortion. This is especially true when you wish to apply any form of EQ. You’re allowed more leeway to push certain frequencies before the drivers begin to operate outside of their comfort zones. This is useful for me as a sound engineer, if I were required to use EQ for – say – a mixing console with sub-optimal output impedance, a specifically coloured audio player, etc. In addition, Empire Ears claim synX improves stereo separation, phase response and SNR, through handpicked resistors, capacitors and filters. A.R.C. (Anti-Resonance Compound) technology is comprised of two separate parts existing inside and outside of the balanced-armature drivers. The first is ferrofluid that they’ve implanted between the magnets and the armatures within the drivers. What this does is dampen the driver sufficiently, such that it removes any unwanted distortions, peaks and vibrations, whilst maintaining a crisp, clear sound. This also eliminates the need for a damper in the sound tube. 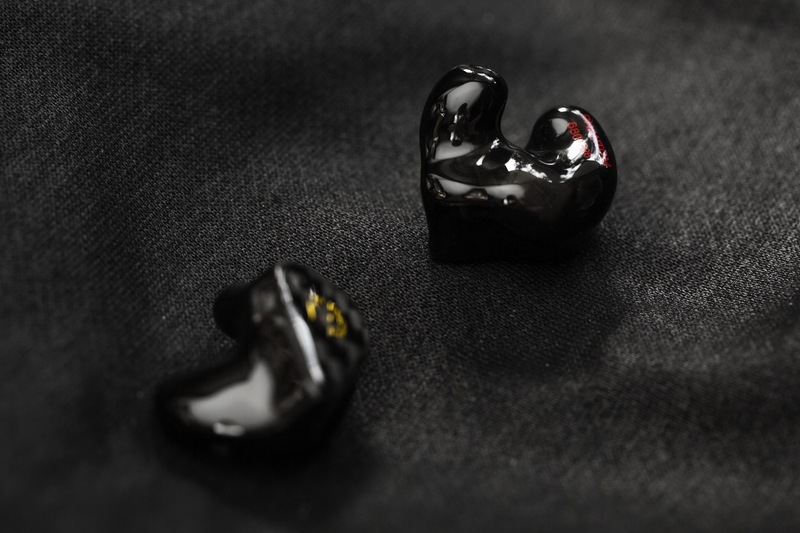 The second part is a proprietary coating that they spray on every component of the IEM – including the drivers, crossovers, tubes and shells – to add solidity; acting as – again – a damper to remove any resonances that may render them out-of-phase. 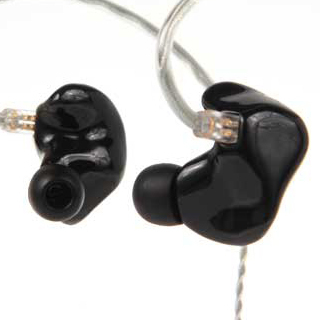 Empire Ears claim increased clarity, deeper bass and an overall more efficient monitor as a result of A.R.C. Instead of the upper-treble then, the Phantom’s 6kHz peak provides clarity and articulation. With the right tracks, transients can come across clear as day, yet infinitely refined. These include RVRB’s Faded EP, Stevie Wonder’s Overjoyedand David Benoit’s Drive Time. But other tracks like Charlie Puth’s Done For Me may end up sounding brittle. This was done to maintain as clear a timbre as possible, so it does not sound crisp or tizz-y when it isn’t supposed to. Despite allthe compromises listed above, the Phantom’s treble does reward handsomely as well. Top-end notes – while softer – leave zero trace as they decay. The soundscape remains free of any bright harmonics, haze or chemtrails. This results in a perpetually black background; an essential foundation to accentuate the true colour of the track. This aids dynamic range as well, as instruments flow clearly between different loudnesses for an endlessly engaging experience. Finally, excellent extension preserves detail retrieval, revealing impressive nuance once you grow accustomed to its sensibilities. Jerry Harvey’s Layla is a bonafide classic – the weapon of choice for dozens of professional engineers worldwide. So, how does the veteran compare to the new kid on the block? Surprisingly (or the opposite, rather) the Layla and the Phantom share several striking similarities. In tone, the two share the same track-first philosophy. The colour the soundscape assumes is determined by the recording and the chain, but both in-ears regardless maintain a sense of organicity; a lush humanity to the way instruments are presented. Where they ultimately differ is how much this lushness intrudes upon the proceedings. The Phantom possesses more flair. There’s a confident, muscular timbre to it that stems from its harmonic lower registers. On the other hand, the Layla comes across more strict; more cool, calm and collected. The Phantom has a warmer bottom, a livelier midrange and a peppier treble, while the Layla’s all display a similar level of quiet confidence. There’s a nonchalance to its delivery that may come across less musical, but will appeal to engineers who are looking for the utmost truth; no more, no less. The Layla’s beauty, then, stems from quality. Its low-end digs among the deepest I’ve heard from balanced-armatures, and its resolution across the board is stunning. This is further exemplified in stage reproduction. The Phantom has an immense technical foundation, but the images that occupy it loom large and full. The Layla compacts its instruments, such that its expansive stage feels even more grand. It provides a theatrical experience that some may consider detached relative to the Phantom. As always, it’s a matter of preference. The Dolores is HUM’s brand new flagship. Like the Phantom, it’s posited as a reference-grade engineering tool. Although the two share similarities, they ultimately diverge in their interpretations of life-like. Although it shares the Phantom’s linear upper-treble, the Dolores posits a cleaner, more neutral tone – courtesy of a 10kHz peak and an attenuated low-end. Transients sound brighter and punchier, but they aren’t much crisper than the Phantom’s. Rather, they’re far more prone to brittleness with hotter recordings, like J. Cole’s verse on Royce da 5’9″’s Boblo Boat. So, the Dolores is cleaner in timbre, but far less forgiving. And although it lacks the sub-bass prowess or mid-bass warmth of the Phantom, the Dolores’s low-end scores high in speed, control and definition. Extension imbues it with sufficient physicality as well. Space is where the two are most alike. Excellent bidirectional extension gives the Dolores a stable, well-resolved and richly-nuanced stage. The two are indistinguishable in width, but the Phantom wins out in depth. This is because of its laid-back upper-midrange, while the Dolores’ is more saturated. The former has a blacker background as well, but in terms of detail-led transparency, the Dolores has the edge with its sharper transients. Micro-details possess greater vibrance and attack. However, this compromises tonal transparency. Although it’s capable of discerning shifts in midrange structure, the Dolores doesn’t alter much from one recording to another in overall timbre and hue. So, I’d posit the Phantom as the mixing and mastering tool, while the Dolores is most viable in editing first and mixing second. The Phantom is a modern classic – discerning, resolving and soulful all the while. Veering from vogue, Empire Ears’ co-flagship forgoes fabricated pizzazz to deliver music in its truest, purest form: A balance built for the professional. But, that’s not to say it’s without its own eccentricities. A harmonic heft tinges its sonic palate, as well as an adamant refusal to conjure any form of hard-edged transient attack; a slip away from the veiled cognomen. But years of experience have come to the Phantom’s rescue, for Empire Ears have truly instilled it with a wonderful technical foundation. Taken together, it’s not a signature all will love – especially those who live on air, crispness and crystalline clarity. But for the listener eager to explore the different flavours, fibres and hues that music has to offer, the Phantom reigns supreme. Erfan Elahi and Wyville like this. My model is a universal version so there might be some variations from a custom model. All listening is done using hugo2 optical out as source. I will skip the build and design as you can find a more in depth explanation at empire ears web page. Instead of going for a more conventional mid forward tuning, the latest models of the empire ears phantom and legend x have a more neutral midrange, partly due to the enhanced bass response in these models. In its original configuration with ares ii cable it has a warm and somewhat dark tonality due to it prominent bass and relative flat lower treble. I perceive it to have a gentle L shaped sound signature. Bass extends deep and transits smoothly into mids that are neutral in positioning. Treble has good extension, contributing to the impressively dark background, imaging and good note resolution. Bass has one of the best reach i have heard from IEM with balance armature drivers. Rumble is emphasized with good balance throughout the mid and upper bass such that it does not come across as discontinuous or bloated. Instruments such as the kick drums are portrayed naturally with an articulate rumble and a realistic reverberation in the note decay. Midrange is well resolved and smooth. But the highlight for me here is the excellent note sustainability. Acoustic and acapella tracks really shines as its dark stage surrounds the listener, with detailed echoes and reverb of each note at their conclusion. Treble takes a backseat with a more forgiving presentation. This is not a rolled off treble as it has excellent extension, rather its a more rounded treble that highlights note contours rather than transient note edges. There is a genuine quality with this treble; you wont find any jarring spikes or harsh sparkle regardless of recording. Though, the lack of treble sparkle results in crash cymbals strikes and guitar strums sound uncharacteristically smooth in certain tracks when they are supposed to convey impact. Some female vocals can sound husky and closed in due to its relatively flat upper mid range. The slower note decay also impacts separation and while its layering is good, instruments can sound congested in fast and busier passages. I sometimes hear a tendency for female singers to sound shouty when they are belting out in the track, likely due to presence of an upper treble peak. There is an upper midrange dip that make the female singer sound boxy and not as sweet. Vocals starts to get shouty on second half of the track when singer belts out towards the end. Bass beats with good impact and is able to keep up and maintain track rhythm. Passages consisting rap and chorus are well separated and dont sound congested. Tried a few different cables with phantom and i only like this 2 pairings. Crash cymbals doesn't some as flat anymore with better defined attack and decay. There seems to be some brittleness in the treble though. Soundstage seems bigger with a darker background. Uppermids sounds sweeter and less dull. Bass is more agile and better defined at the expense of some naturalness due to an attenuation of upperbass for a cleaner stage with less warm air. Female vocals benefit most, having a sweeter tone but there is a tendency to sound shouty on certain tracks. This is my favourite pairing. Better treble presence but not as noticeable as pairing with horus. Background is darker with a wider and deeper soundstage. Bass sounds a bit more defined. Uppermid dips are still present in female vocals similar to stock cable. Both have pretty accurate timbre but VE8 edges out here due to its more realistic portrayal of upper mids and harmonic based instruments. Soundstage is wider in VE8, depth wise maybe slightly more in phantom. 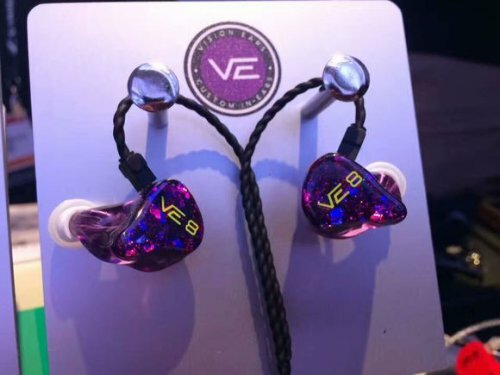 Phantom has the better bass extension but VE8 has wins in PRaT due to a less prominent emphasis on upper bass which contributes to better dynamics and rhythm. Lower mids sound pretty similar with phantom having a slightly richer body while ve8 having more density in its notes. Uppermids is where they differ with phantom sounding duller with some female vocals while ve8 sounds lighter and more natural. Treble has slightly better extension in phantom, but Ve8 has better linearity. The result of this linearity is reflected in the tonal quality and balance of its instrument and vocals. Transient attacks are more defined in ve8 making it the more engaging option for live music, such as rock and metal. This is similarly a 5 driver iem with an organic and musical signature about half the price of phantom. Bass has more dynamic impact and better separation on SD5 as a result of a faster dip from the sub bass onwards. Bass extension, texture and definition wise goes to phantom. Mids are more forward in their positioning with more density but is not as smooth and rich sounding as phantom especially lower mids. Uppermids dont suffer from dullness but tends to get more shouty and edgy than phantom especially with power vocals. Treble has more sparkle with better attack transient but is not as controlled or well extended as phantom. Another 5 drivers again, this time with a closer price gap and a clash of natural tunings. Like the Phantom, aether possesses excellent timbre and tonality. Starting with bass, aether focuses more on sub bass but is unable to reach the same extension as phantom. The bass lines can sound a bit woolly and there appears to be some bleed into the lower mids. Similar to the Phantom the upper bass imparts warmth and body to the midrange but phantom has more defined bass to mid transition. Mids are more forward on Aether with better presence and linearity in low to upper mids transition. This imparts it with a better ability to express emotions in songs compared to a flatter but higher resolution midrange in phantom. Treble takes different approaches in both but manages to derive a fatigue free listen. Aether has more prominent peaks in the treble region giving it better clarity with more sparkle and liveliness. But its dampened treble results in a sparkle that is well controlled without any sharp spikes. Phantom relies on its treble extension and a 7k peak for detail retrieval and yields a better resolution. If phantom invokes the ambiance of a small concert hall the presentation samba exudes belongs to one found in a studio setting. At first glance/listen the jomo samba can be considered as the opposite of phantom. But a closer examination will show several similar traits which they derive their performance from. Starting with stage, samba has less width but slightly more depth. Both have an upper treble peak that generate a dark background, but phantom's background is darker and more stable in comparison. This is impressive considering that phantom has thicker low-mid notes, but samba offers a cleaner stage from its leaner more precised notes and an upper bass dip. The notes that samba creates flashes like sparks while the Phantom notes are like fireworks with a slower and more sustained decay. Transients are expressed in samba with better precision and liveliness while phantom has further extension at both ends and fuller bodied instruments. Both can be considered somewhat dry, samba due to the lack of warmth in its midrange and phantom due to its neutral and flat upper mids. The phantom's dark and smooth signature with its unwavering note sustain and emphasis in low/mid harmonics is not going to be everyone's cup of tea. It does not play well with every genre, but what you will get here is a relatively fatigue free listen and an appreciation of note texture and overtones in the your everyday track. Misson07 and deafdoorknob like this. The Phantom is the result of constant reinvention. The ambition to push for more. To go beyond the conventional. With precision crafted performance as the touchstone and innovation as its creed, new ways were created to engineer, design, and build a revolutionary in-monitor. Introducing the Phantom - a pure IEM tuned in perfect balance, created and crafted to master every genre with absolute fidelity. I have been listening Empire Ears for long and finally decided to write a review on the Empire Professional (EP) Series TOTL, Phantom. The EP series started with the Empire Vocal Reference (E.V.R) then Empire Studio Reference (E.S.R) and finally the Phantom. 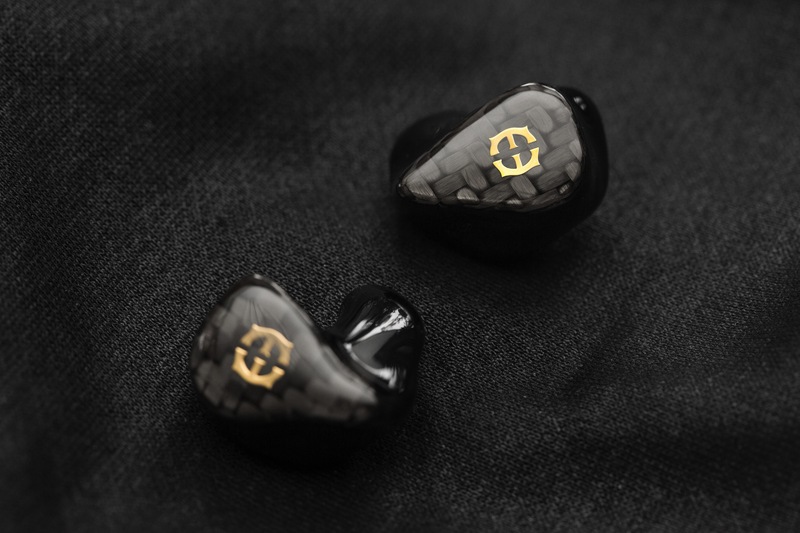 I like how sincere Empire Ears is when designing their IEM. They chose Effect Audio Ares II as their stock cable. The cable is rigid, and it matches well with the phantom most of the time. Minimum effort is needed for cable rolling. 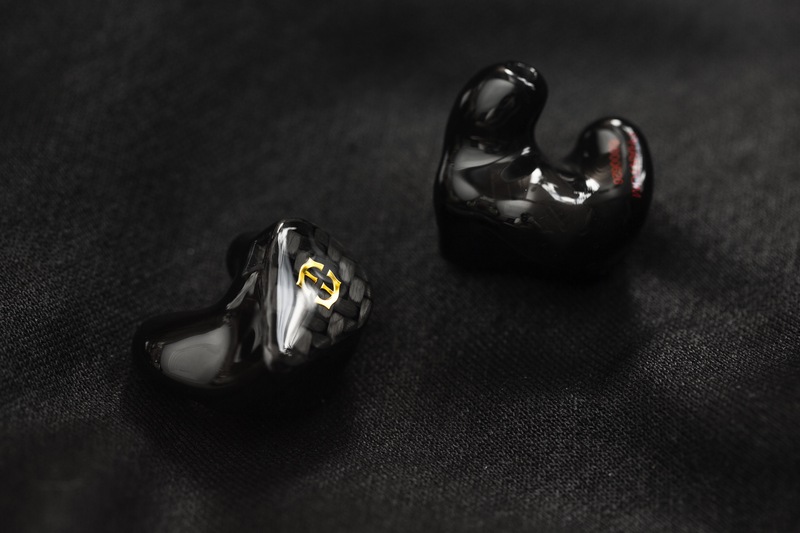 The Phantom is Empire Ears bold assertion to challenge the status quo; a new take on a reference iem that performs at the highest level concerning both timbre and performance, rather than a compromise between either. Offering a sound befitting its name, the Phantom's sole mission is to disappear, and let the trueness of the music shine through. Besides industry-leading tonal accuracy, the Phantom promises both high resolution and transparency, with a versatile signature aimed to please both musical professional and audiophiles. Building forth on Zeus' impressive vocal display and three-dimensional stage, the Phantom adds a touch of warmth to achieve its perfect timbre, as well as a smoother sound. A mission fulfilled by a beautiful lower treble, and excellent top-end extension. Finally, by relying on deep low-end extension and a tastefully lifted bass, the Phantom's bass makes a compelling argument when called upon, while equally taking a step back when required. Empire Ears embedded a few technologies in the creation of Phantom. The technologies such as synX Crossover Network and A.R.C Resonance Mitigation Technology are explained in detailed on Empire Ears websites. For those who are interested can browse and read through. I chose Universal with 3.5mm terminated when I order this IEM. 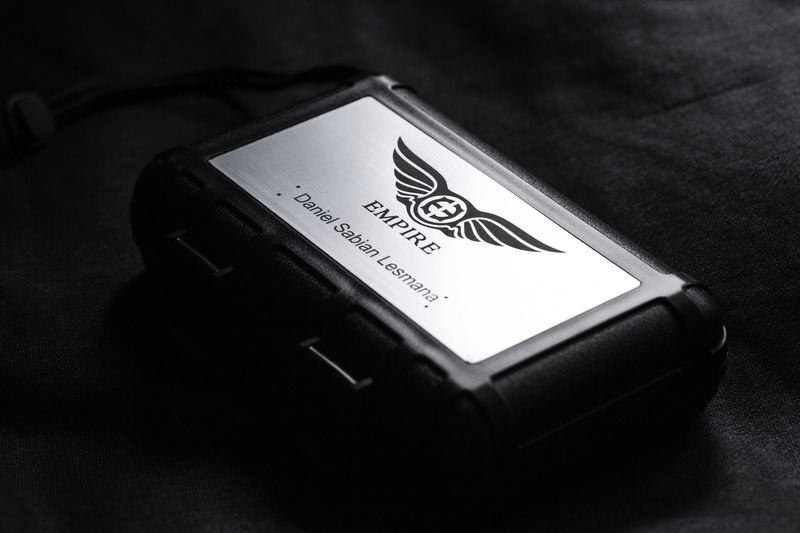 The shell is Piano Black with Empire Ears Logo on it – shiny and nicely done. I love the colour matching. The shell could potentially be huge for those who have relatively smaller ears. I would recommend them to opt for Custom fit for the best result. 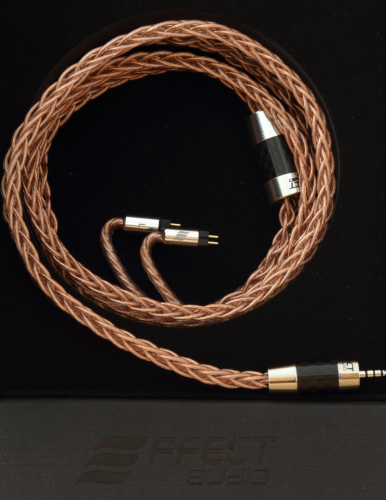 I used Opus #3 and 2.5mm terminated Effect Audio Ares II Cable for this review. In the latter part of the review, I will introduce a bit on source matching and cable rolling which are done by me when auditioning the Phantom. 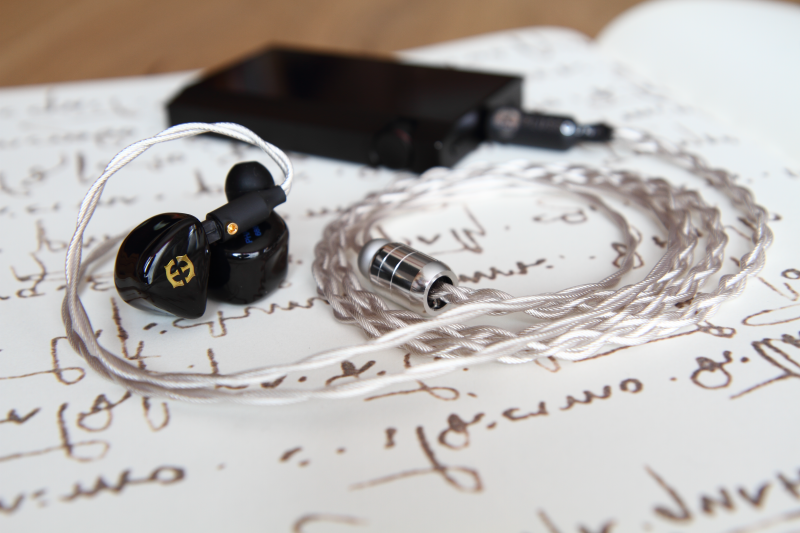 The overall sound signature of this IEM is warm and smooth. It is relaxing to enjoy the music with this IEM. There is a slight emphasis on the lower frequency as compared to others over the frequency spectrum. The soundstage is relatively wide – Zues’ shadow can be seen here. There is sufficient amount of air and space - the imaging and separation is supreme. All these signatures hits what I desired – I love it. 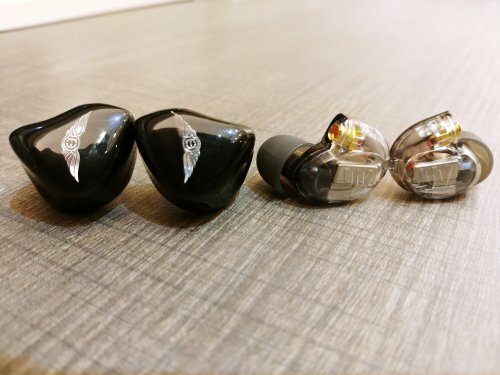 The depth is good – deeper as compared to a lot of the IEMs in the market but not as deep as Legend X.
I am not a bass head, but I do appreciate good bass especially energetic kick. Overall, the lows are nicely tuned – Rich body. The attack can be considered hard and fast with a short decay time. However, on some of the track (Hotel California and Hello), I find the lows can be a little tubby. This could potentially be mitigated through cable rolling or source matching. When I am listening to Beat It, how Phantom creates the kick impressed me – energetic and powerful. I will highly recommend the community to try this especially Michael Jackson lovers! Another fascinating point is how Empire Ears designed the bass presentation of Phantom. To me it sounds like a subwoofer kind of bass. I find that Legend X is the closest in term of subwoofer bass presentation, but Phantom is close too. Well done Empire Ears! If you read my previous review on Campfire Audio Solaris, you will know how much I appreciate good vocal presentation as a mandopop lover. Overall, the mids presentation is pleasing for me. I love the presentation. However, the mids sometime can be blanketed by the over-power lows presentation. I suspect choice of cable could be the culprit and yes, I will further explain this in the latter part of cable rolling. The female vocals are silky smooth. For Somewhere, Somebody is played, Jennifer Warnes sounds gentle, smooth and full of soul. The layering is precisely and accurately tuned. Phantom makes Adele and Norah Jones sound extraordinarily sweet. The mid highs are breathy. However, the body of mid high could be a little thicker. For male vocals the body is sufficiently rich. I love how Ed Sheeran sounds. On some of the track, the mid can be slightly recessed because of more emphasised on the lows frequency but again cable rolling does help to overcome this. The cymbals sound crisp on Phantom. The highs are well extended with good roll-off. The overall presentation is well delicate without piercing. However, if we compared in term of the emphasis in the frequency spectrum, I would for the emphasis to be shifted a little bit to high. I am a bright IEM lover and this IEM could be a little too warm for me. I know the full potential of Phantom is not unleashed yet with the current pairing. Do continue reading and I will unleash the full potential in a while. The mid highs have a better extension with this cable. Adele sounds sweeter and smoother in this pairing. The low mids is slightly pulled back. The overall separation between mid and low is improved. Overall, the sound signature becomes more airy and brighter. The lows is more well controlled with this cable. It improves the attack and decay speed of the lows as compared to Ares II. For mids, I always like how Eros II+ present the rich and soulful mids. The mids now have more emphasis. The treble is improved too. Although it is not as much as Thor Silver II+, I think it is sufficient. The general sound signature is more balanced with this cable. I find that this is a good match with Phantom. Maybe Empire Ears can include this option. I used my Ares II (2.5mm balanced terminated) with a 2.5mm to 4.4mm adaptor on this DAP. The depth is now better as compared to Opus #3. The high is more sibilant, and the lows is faster (both attacks and decays). The overall presentation is now more balanced and smoother, especially the mids. This pairing could yield more favourable micro details presentation. This is a more musical pairing unlike NW1Z. The presentation is more fun and livelier. Soul and spirit are now further added to this IEM. The highs are further extended but still without piercing or fatigue causing. The overall sounding is now more forward. As mentioned in the earlier part of this review, the lows on Legend X is more like a subwoofer. The attack is as fast, but the decay is longer. This caused it to have a more “V” shaped sound signature. The soundstage is wider as compared to Phantom. Legend X would be a better choice for bass heads. This is the fight between penta-drivers IEMs. Andromeda exhibits a brighter and more analytical sound signature. The lows are faster and more precise as compared to Phantom. However, in term of strength and energy, Phantom did a better job here. The micro details on Andromeda is better because of huge amount of air and space in its sound signature. Close fight! Solaris is a more well-balanced IEM. 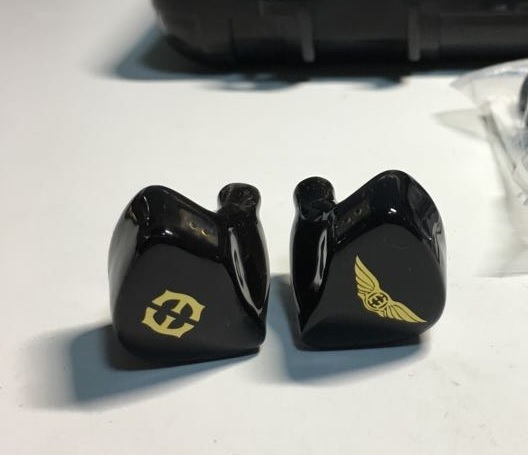 The price of these 2 IEMs is pretty close. The bass on Solaris is more well controlled but with Effect Audio Eros II+, this could bring Phantom up to the arena again for the fight. Another close fight! Seldom see reviewers bring this IEM up for comparison. The fitting of this IEM is better because of its smaller shell. It sounds more balanced and the presentation of micro details is better. UMPro series is designed more for monitoring rather than listening. This could cause a little bit dull and lack of soul in the sound signature. Phantom gives a good uppercut of UMPro 50N. This IEM sounds darker, way darker than UMPro 50N. It is power hungry as well. I always pair it up with a dedicated amp to enjoy it at the fullest. Phantom is more engaging and fun when compared with M9. Definitely, M9 is more power efficient and this make it more pocket friendly when travelling or commuting. Phantom, nicely tuned by Empire Ears with a lot of efforts and technologies embedded in. The overall sound signature is pleasing and the accessories in the box is generously provided. Cable rolling and source matching can be done to fully unleash the potential – creating a Phantom Assassin that wins your hear in the dark. Stay tuned to my Instagram Page. Let me know which IEM you wish to see in the next review! Erfan Elahi, Aslshark, Lucky LZ and 4 others like this. Disclaimer: I purchased the Phantom full-price from Empire Ears for my own enjoyment and under no obligations. While EE did request this review in exchange for another consideration (shoutout to Jack and Devon for their excellent customer service! ), I was already half done with it at that point, and there was no incentive provided for a positive review. Here, most people detail Empire Ears’ history, first as EarWerkz, then as, well, Empire Ears. All this predates my initiation as an audiophile, and is easily available elsewhere, so I won’t reiterate. I don’t review packaging, but I will say everything arrived safely. With that out of the way, below is the actual review. Presentation: The Phantom is marketed as something of a spiritual successor to the Zeus, but, though I haven’t yet had a chance to hear it, from what I’ve read about the Zeus I believe “spiritual” is key to the phrase. The Phantom does not present a massive, powerful midrange. Mids are ample, but I wouldn’t describe them as exceptionally forward. I’ll go into depth on the frequency response shortly, but what the Phantom does present is impeccable timbre. Everything sounds real. Voices, instruments, even synths feel less artificial somehow… Placebo or confirmation bias perhaps, but my ears don’t care what you pesky psychologists and statisticians think: they’re busy enjoying themselves. The Phantom is warm, but this effect is exaggerated by the included Ares II cable. Paired further with a warm source, its energy begins to fade, and it loses bite. If you listen to a lot of “hard” genres: rock, grunge, metal, or even certain electronic fare, the Phantom won’t be ideal; but between a bright source and a silver cable it might be possible to grind it into shape. The bass extension on the Phantom is also excellent. While the sub-bass as a whole is slightly subtler than the mid-bass, it’s still linear: no disappointing roll-off in the extreme depths. The rumble won’t rearrange your organs, but it might make you look outside for roadworks, which is perfectly adequate as far as I’m concerned. Impact is a little subdued: thump is a better word than slam here, but there’s no bloom or muddiness, just a polite attack and a medium-fast decay. Not even big drops will deliver a viscerally satisfying smack, but the bass won’t become fatiguing either. Heavy, layered basslines can blend a shade too far, but most others are resolved quickly, with notes spaced well without sounding detached. If I had to describe the Phantom’s bass in a word, “smooth” would be it, said with most positive inflection. Mids: The Phantom’s mids are curious: timbre, detail, and therefore realism are exceptional, but weight is somewhat lacking. They aren’t recessed, but often vocals don’t sound like they’re being sung with any emotion. This isn’t per se a bad thing, but the Phantom’s warmth and timbre don’t want “reference” mids—they yearn for a soul. Just a few more dB forward and the mids would have been perfect. As it is, while the mids themselves don’t sound mediocre, they tend to make singers sound it. The argument that “mediocre” by definition includes most singers doesn’t escape me, but a little help from one’s audio equipment goes a long way, and the Phantom just doesn’t give it. Midrange instruments, on the other hand, are just dandy: the Phantom’s timbre gives them a voluptuous resonance while its surpassing detail maintains credibility. Guitars in particular sound so good through the Phantom that I’m strung trying to find ways to describe it. Moreover, the singers that don’t need help—the well recorded, well mastered, and, well, talented ones—are astonishing through the Phantom, for the same reasons above. I leave it to the reader to judge whether a significant portion of their vocal music qualifies. Treble: The Phantom’s treble is pleasantly unremarkable. It’s detailed, clean, and present, but there’s no grand air or sparkle. Relatively, it’s recessed, but it’s not anemic, and when it needs to be the focus it doesn’t leave you sad. I’d be surprised if it managed to fatigue anyone, ever; despite this, extension is strong, and snares and cymbals are crisp and detailed. In fact, the longer I spend listening to the treble the more it impresses me with this effortless tightrope performance—similar to the bass, but subtler: I didn’t discover it until I wanted to. I’ve changed my mind: the Phantom’s treble is remarkable, just not ostentatious. Bravo. Resolution: The Phantom’s resolution is incredible. It's the first IEM I’ve heard to challenge the mighty Etymōtic ER4XR in this respect. Not only that, but the Phantom actually outdoes the ER4. This may sound obvious considering the Phantom costs five times as much, but even the InEar ProPhile 8, which is also >$1000, and is designed as a studio monitor, can’t touch the ER4. Toppling this champion is an impressive feat, whether it cost $375 or $3750. Further, thanks to its balance and reliance on technical prowess rather than treble peaks, the Phantom integrates its details. Unlike with the ER4, they aren’t thrust in front of the music, nor do you have to hunt for them as with the PP8: they’re just there, part of the music rather than a separate distraction. Soundstage: The Phantom is marketed as having a “three-dimensional soundstage.” While I suppose this is technically a fact, the Phantom’s soundstage is neither equiplanar nor expansive: it’s both wider and taller than it is deep, and it’s rather close. Intimate isn’t quite right: instruments have sufficient space and the Phantom isn’t claustrophobic, but like Turnus with his boulder, the soundstage, while greater than average, struggles to throw anything far. Live recordings sound like you’re in the very front row, and studio recordings restrict themselves to the x-axis unless you make the effort to close your eyes tight and imagine things more spread out. I’m no soundstage nut, but even I could do with some more depth, if only to complement the Phantom’s sonic realism with similar spatial realism. As far as the universals go, the construction feels solid. The included Final Audio Type E silicone tips come in a reasonable range of sizes and are comfortable and secure. The included Ares II cable also deserves mention for its solid look and feel and attractive sheen, though the splitter seems unnecessarily heavy. Consequently, long sessions can cause pain around the outside of the ear. The shells are large, but the nozzles taper aggressively and a proper seal doesn’t require deep insertion, so people with small bowls might have an issue, but those with small canals shouldn’t face too much of a problem. Isolation is very good. Not the best I’ve heard, even ignoring the positively unsafe ER4, but good enough to use on the bus, so good enough for me. Unfortunately, the Phantom is incomparable to any other IEM I own; within my collection it is unique: in price, in mission, and in execution. However, for the sake of completeness, and to assist any time-delayed clones of myself, I’ve included a few words of contrast. InEar ProPhile 8: The ProPhile is colder but not much cleaner for it. Inferior separation. Switches help pair it to more sources. More comfortable. Details are less apparent. Soundstage is more track-dependent but larger in general, deeper in particular. Extension is similar. Balance is close, but bass is subtler and treble is more prominent. Noble Audio Sage: The Sage has a more pronounced n-shape frequency response. Bass hits and decays faster but is less textured and less respectful of the mids. Rolled-off on both ends. Similar soundstage. Less comfortable (why is it bigger when it has less than half the drivers?). Similar separation. Audio-Opus Opus #2: This is the first time that my preferred DAP has been simply incorrect. 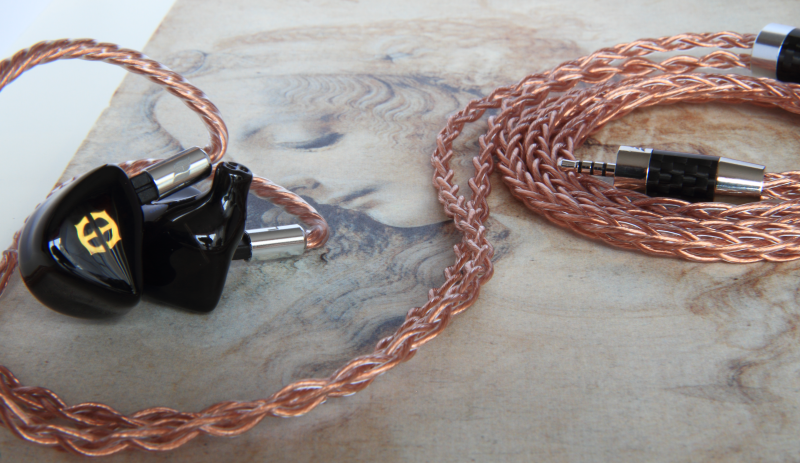 This pairing is too warm between the Opus, the copper cable, and the Phantom itself. It doesn’t become muddy, but the mid-bass does become awkwardly prominent, and both devices are done a serious disservice. The Opus does broaden the Phantom’s soundstage and extend its detail-retrieving tentacles even further, but it isn’t worth the tone’s suffering. Maybe this could work with a very bright cable? iBasso DX200 (Amp 1): On a related note, I practically had to rewrite this review once I stuck the Phantom in the DX200 after testing it mainly with the Opus. The DX200 pairs beautifully with the Phantom, staying out of the way that the Phantom fully displays its unique character. The Phantom’s tuning is so particular that a totally uncolored DAP may just be the correct approach, and that description fits the DX200 well. Hiby R6: As always, the R6 is less sophisticated than the Opus #2 and DX200, but this time around the bass focus doesn’t do anybody any redeeming favors: the Phantom doesn’t need any help with low-end detail, and its balance is upset by the R6’s L-shaped response. Perhaps an IEMatch would patch this pairing up, but while I can’t speak to that for sure, I can recommend against this pairing without one. Other stuff: The Phantom plays relatively nice with lower-quality sources: I was able to listen to it out of my LG G3 and Thinkpad X1 Carbon 2018 for significant periods of time without envying Van Gogh; though that wasn’t true of my desktop, which traumatic experience I don’t care to relive long enough to recount. If you don’t have dedicated source components or the extra cash to acquire some, I would look elsewhere: the Phantom may or may not punish you for it, but either way you’ll miss much of what it has to offer. The Phantom is fairly versatile, but it’s not for everybody: any sort of “-head” stopped reading this review a long time ago (or had nothing else to do), the Phantom’s warmth doesn’t work well with some genres, its detail might present a nasty surprise to fans of certain vocal acts, the soundstage is a little underwhelming, and $1800 is a lot of money; however, if your musical taste and other equipment are appropriate, I strongly recommend the Phantom. Give your ears time to adjust to its unorthodox approach and I anticipate you’ll come to respect, admire, and enjoy it as seriously as I have. SeedRick, soullinker20, noper and 8 others like this. Really well written. You're descriptions are a delight to read. I'll certainly pay attention to your reviews..
Cons - Sound strongly hardware dependent. Empire Ears has established itself as one of the biggest players on the in-ear headphone market. Based in Bufford, USA, Empire Ears offers a wide range of first-class monitors. The last product line was mostly themed after Greek Gods, with Zeus naming the mighty flagship incorporating 14 drivers per side. There has been an impressive amount of publicity, as only very few contestants managed to tune such a large amount of drivers as accurately as Empire Ears. Besides, the Zeus had been developed over three generations, starting from the Zeus XIV with a highly resolved and straightforward sound, over the Zeus R with a rather reference signature towards the Zeus ADEL, utilizing a membrane-based valve that alleviates the pressure imposed on the ear drums. 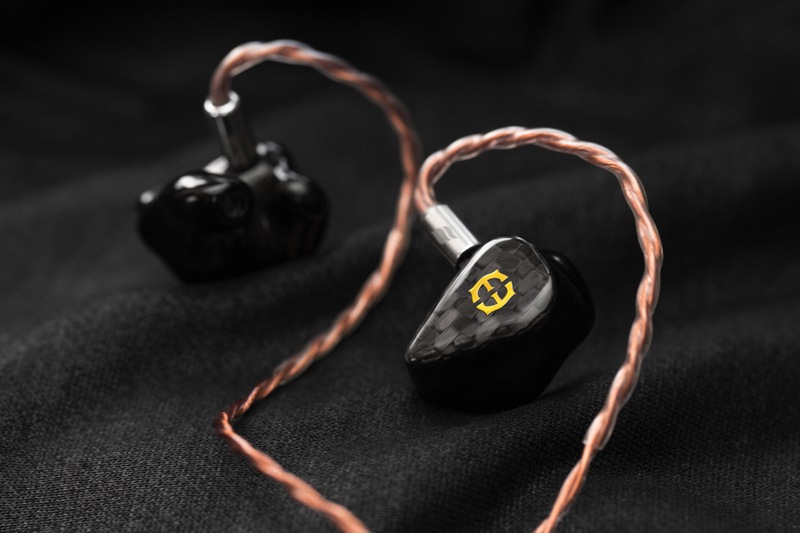 With the X-series and the EP series, Empire ears published two new product lines in 2018. The X-series consists of four hybrid monitors, with the Legend-X as the top model, profiting from a delicate interplay of balanced and dynamic drivers. The EP series, in contrast, follows a more conservative approach in a sense that the three units in this line are entirely based on BAs, without any hybrid architecture, ADEL modules or other tech gimmicks that gave Empire its innovative and versatile image. The flagship of the EP series, the Phantom, has certainly raised a few eyebrows as it has only five drivers. This being said, the number only sounds small because of the driver war during the last years, where companies deviated from the line of having accurately sounding in-ears towards a “more-is-better” strategy, gearing up their units with as many drivers as possible. As a result, the market got overwhelmed with mostly poorly sounding and expensive headphones. Before that, two to five drivers had absolutely been normal, and if we lean back and recap this period a bit we have to admit that earlier generation high end IEMs with fewer drivers sounded just as good. Prominent examples are the FitEar 335, the Spiral Ears 5-way or, as an extreme, the Warbler Prelude with one single driver. Now what exactly happened in between? 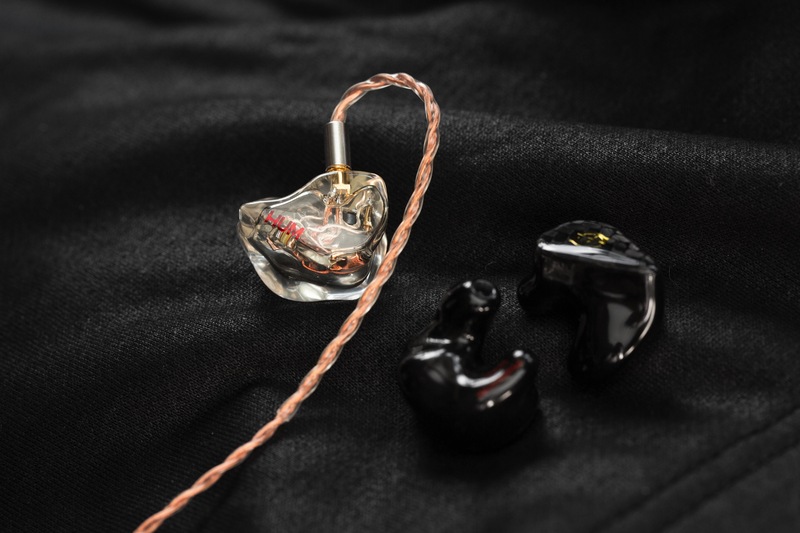 Over the last years, a lot of new players emerged in the jungle of in-ear audio, and it got notoriously difficult to establish yourself in the, I would conjecture, oversaturated market. Similar to the megapixel war with digital cameras in the early 2000s, it sounded cool and impressive to have first 9, then 12, then 14, up to 18 and even 20+ drivers in your in-ear – on each side! Were the small cameras with 20 megapixels better? I guess it is safe to say no, but as a marketing gag it worked, at the beginning at least. An analogous situation occurred on the in-ear market, that peaked in 2017. And now, as if nothing happened in between, we are back to normality. 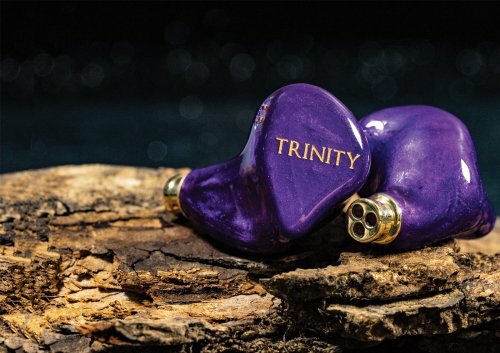 Few drivers with a precision in tuning that was not possible for a high driver count are on the run again and, to make a quick qualitative statement, they compete easily with the best IEMs of the last years. In this review, I am diving into an extensive discussion of the Empire Ears Phantom. There are two reasons why I picked the Phantom over the, equivalently amazing, Legend-X. On the one hand, I was born with strong tinnitus and the sharper treble of the Legend-X sounded unpleasant to my ears. On the other hand, the sound of the Phantom amuses me greatly and presents a perfect example of a simple, yet technologically top notch, monitor that overcomes the limitations even of the best in-ears of previous lines. With a price of 1799 USD, the Phantom is surely no bargain but carries a tag that is fairly average on nowadays’ market. This review is built up as follows: first, I discuss the configuration and built of the Phantom. Afterwards, a full analysis of the sound is presented. Then, a small interlude compares the Phantom to the Empire Ears Zeus. Finally, cable pairings are elaborated and conclude the main section of this article. The Phantom features a 2 low – 1 mid – 2 high configuration of BAs, while five crossovers control each BA individually. In the previously released Zeus XR technical modifications, such as ADEL modules or plastic levers that change the signature and crossover layout, gave a quite fragile impression of the build. The Phantom, on the contrary, has a plain shell and faceplate, without any of the aforementioned features, such that the shells appear to be very robust. The components fit into a small shell, making the IEM a very wearable and light unit. I felt that the fit got better compared to my previous Empire Ears monitor, where I had some issues on one side. The new ones fit splendidly and allow for long wearing sessions. However, compared to in-ears by brands like FitEar, the shelling can still be improved: like the Zeus, the plastic shell is relatively thin. Therefore, external sources of noise are drowned out when listening at normal volumes but on lower volumes the background is definitely audible. Two positive upgrades are the available designs and the stock cable. To begin with the looks, Empire expanded its palette of colours by a whole new set, featuring some new tones that fit the faceplates much more. I had the feeling before that the faceplates always looked amazing, while the shells sometimes did not offer the proper pairing in colour. My own IEM from the pictures use Titanium as a shell colour, finished by a carbon faceplate. The shell is slightly sparkling; the faceplate has a shimmering light reflection effect that makes the IEM overall look great. 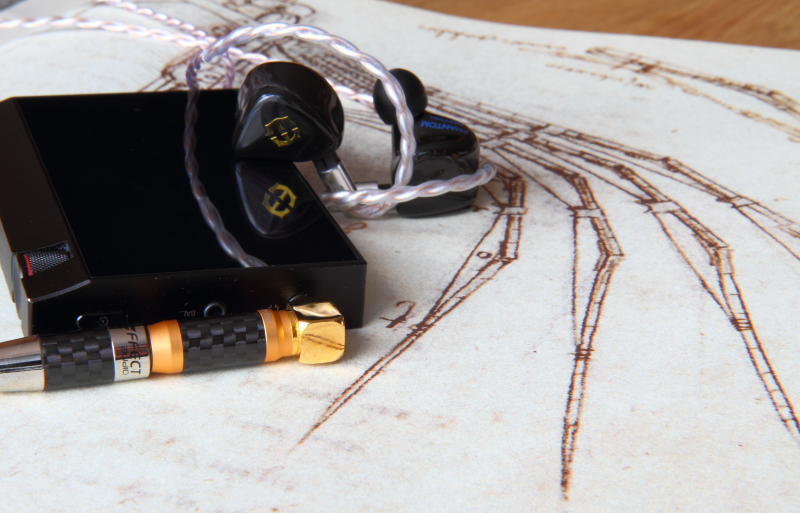 The second very enjoyable upgrade to previous items is the stock cable: both new product lines come with the Effect Audio Ares II, which is a decent copper cable that offers a good match with the signature of the Phantom. From that perspective, expensive upgrades to other wires are not the most important task anymore after receiving the IEM. When I listened to the Phantom for the first time, the most dominant characteristic to me was the organic and natural sound. So far, I had listened to more reference-oriented IEMs, such that there had always been an emphasis on wide and clear treble and the higher middle range. Often, I found in-ears with a lower mid or bass focus too dark, such that these IEMs had not been my first choice. 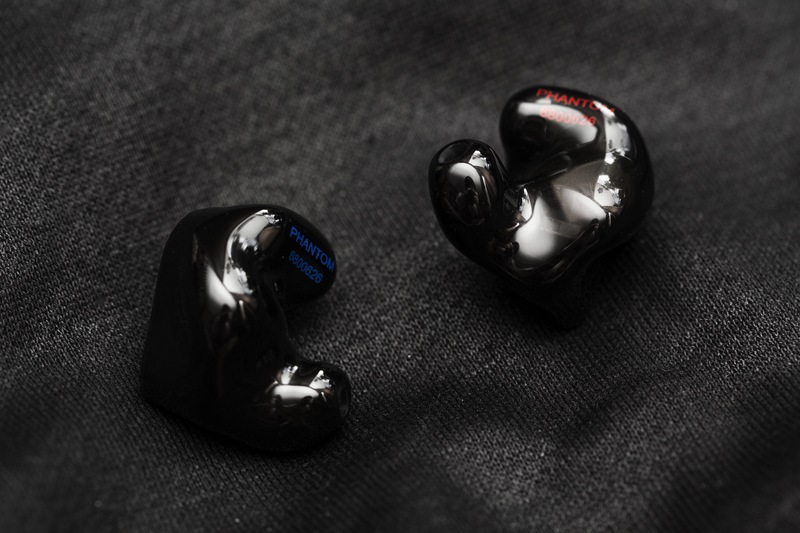 The Phantom is the first IEM with a focus on mids and lower mids, without being dark or performing unsatisfactorily in the upper mids and treble stage. The sound is beautifully natural on all stages that I instantaneously fell in love with it. This does not mean that the sound is soft, smooth and round – it rather means that the sound is reproduced in the intended way, without adding much own signature. For example, if you listen to vocals you will find a wonderfully smooth voice, one of the best on the in-ear market. It is sparkling and enchanting in high notes, and full and strong in low ones. If you listen to heavy metal, the Phantom is fast and responsive, reproducing accurate and harsh picks, as well as rough and growling vocals. If you listen to electro, tunes will sound shrill and synthesized, with sharp edges and artificial tones. 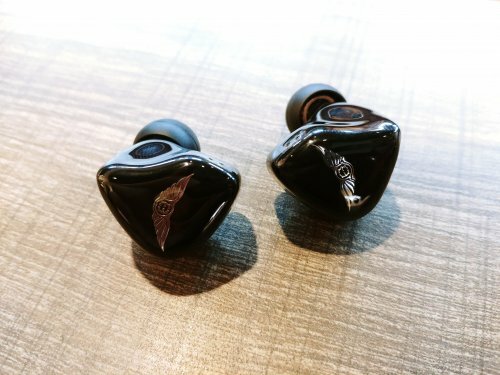 Altogether, the Phantom is an extremely versatile IEM that just sounds like you sit in a concert hall and listen to any type of music live, in the way the artists intend. I used the word organic in addition to natural to indicate, that the sound has a fair amount of warmth in its tuning, which adds some lower-mid emphasis. However, this does not boost the bass as it often is the case, but leads to a full and dense, yet accurate representation. The focus is in the mid stage, with clean and strong control over the bass, preventing it from overwhelming the higher mids and treble. Combining this feature with the specs described above leads to a truly warm monitor with an organic sound, that can enchant with sparkling and clean treble. This balance has always been one of the most desirable ones. Yet, a monitor, which combines the benefits of a warm and a cold tuning, was usually not realized very well as these antipodal points on the map of sound signatures usually influence another. Hence, it is truly amazing that the Phantom unifies both strengths. 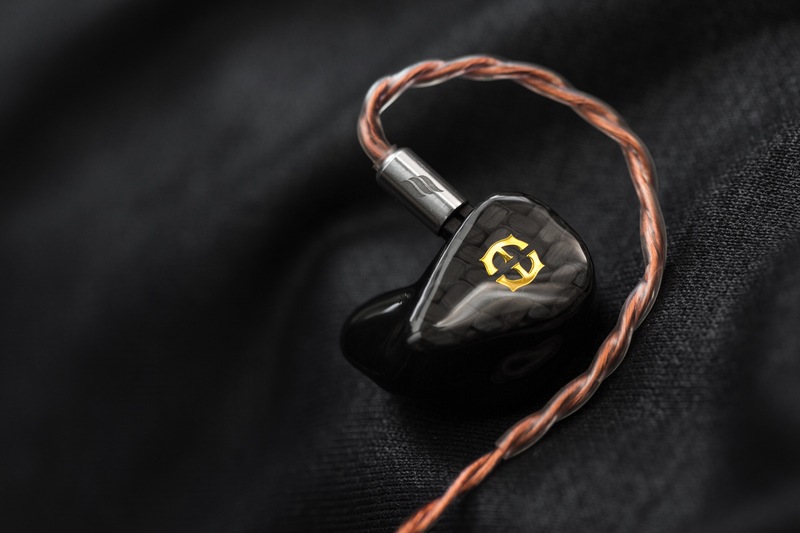 This sound and feeling may take a while to captivate you: many in-ears convince with a tuning that sounds exciting, with sparkling and broad treble or rumbling and high-pressure bass. The Phantom, on the opposite, does all of that on demand, just as the record intended to. This may sound a bit unexciting at first, depending on what you feed in. After some warm up, however, the IEM convinced me and I could not go back to my reference monitors for everyday listening. From the more technical side, the Phantom offers top notch specs only single other IEMs on the market can compete with. The sound shows a wonderful tonality, with colourful and thick notes. Nonetheless, the stage is very wide. It is often a trade-off between dense tone and stage width, as commonly airiness in the sound leads to a diluted image that appears to be wide. Yet, this approach comes with the cost of a less powerful and more laid-back representation of the sound. The Phantom reaches a splendid balance in between and has a wonderfully, yet not artificially, wide stage. Some reference monitors with a stronger focus on the higher mids and treble may be twenty percent wider, but as mentioned before, not necessarily more pleasant or technically riper to listen to. On the other hand, the sound is still natural in density. Some IEMs on the market have a thick, almost liquid sound that is overly warm, leading to beautiful voices and slow instrumentals, but failing spectacularly when fast and complex music, for which separation and stage in between the notes is crucial, is played. This also brings us to the next strength of the Phantom: separation and detail. The separation is very sharp between the notes, despite the warm signature. Notes can be localized very precisely in space and there is close to no overlap and fuzziness in between the notes, even for fast and complex music. This makes the Phantom a fantastic all-rounder: before, I tended to listen to metal on a more reference-like IEM like the Zeus R, whereas vocals and instrumentals sounded nicer on my FitEar 335 SR. The Phantom can do both perfectly. Also, the level of detail overwhelms, to an extend that makes the music sound scarily real. When strings play, you hear every audible bit of its oscillation, every screeching when the bow slips slightly, and the full reverbing body of deeper notes played by violoncellos and contrabasses. Slightest instabilities in singing are revealed, as well as, for example, scratching or other rough sound when listening to electronic music. Combining the massive detail with the thick and warm sound leads to another feature I would like to briefly talk about: realistic physicality of the sound. With physicality I do not mean how realistic instruments and voices sound compared to a concert. Rather, I am referring to another dimension of sound, namely the impact. With more spacious sounding IEMs, dilution of the sound often comes with a more laid-back tonality, leading to a lack of power and impact on the eardrum. Here, on the contrary, the sound of the Phantom strongly stimulates the ear. Guitar picks pinch, electronic music scratches and bass pumps. For those who were a fan of the ADEL-based IEMs of the last generation, the pressure during fast and heavy bass kicks may be a bit too much, but the issue can be easily resolved with a suitable cable paring as described in a later section. For bass lovers, the strong pumping pressure will please you, guaranteed. Before I continue with a more specific analysis of the single stages, I would like to make one comment about the handling of input music files. Once I started to listen to my FitEar 335, I realized that some monitors can be brutally unforgiving if the recording is not good. Now you may say that an IEM cannot interpolate poor recordings to an amazing listening experience, invalidating my point. However, there are strong differences in how well IEMs handle different qualities in music files. For instance, the huge stage and reference signature of the Zeus R made fast and complex music enjoyable, whereas the liquid sound of the FitEar made me skip entire albums or even genres as it sounded disastrously messy. From this point of view, I would like to give tremendous credits to the Phantom. While high quality recordings sound as they should, albums of mediocre quality manage to sound exceptionally good compared to other IEMs as well. While before I shifted my focus in listening to technically good recordings in order to listen to the capabilities of my equipment rather than the music itself, I am finally happy with paying more attention to the type of music again, as there has not been any piece that forced me to skip. In the following, I will analyse the treble, mid and bass stage more explicitly. The standard cable pairing with the Ares II is extremely warm, setting strong emphasis on the lower mids. I will give a description of the general tone and specify how a different cable pairing can change and potentially improve the sound. A later section discusses concrete pairings for the Phantom. All impressions were obtained by using the Cowon Plenue S as a source. Treble. The signature of the Phantom is slightly on the darker side. This affects the treble stage: when pairing the IEM with the Plenue S, the combination of warm IEM, cable and DAP lead to a slightly muffled treble that lacked in sparks and width. When I listened to the Phantom for the first time this was slightly disappointing, as I tend to enjoy reference sounding in-ears. The solution here is a new cable pairing: with a silver-copper hybrid the sound magically opened up. The dull sounding high notes suddenly sound bright, yet without sharp or shrill ends. This was particularly interesting for me as in-ear monitors with emphasis on higher mids and treble tend to have a certain level of analyticity in sound, which may hurt sensitive ears as my own. Here, in contrast, you have a wonderfully smooth and accurate representation of the treble stage, while the warmth of the IEM manages to tame shrill ends. The stage becomes considerably wider, yet without diluting the sound. Instead, you will experience thick notes that let voices and instruments sound colourful and musical. The cable-based emphasis on the higher part of the spectrum also improves resolution and separation. In the standard configuration, the dark sound lead to slightly smeared out notes. However, the Phantom, paired appropriately, can have a great resolution among the notes, which, in combination with the ability to separate the notes sharply, leads to a very clean and precise sound. For such a warm IEM this is rather rare to achieve, as this sound signature is normally found in colder, reference-tuned IEMs. For that reason, the Phantom scores greatly for achieving this unusual, yet desirable balance. One more word about the detail: as described in the preliminary part of this section, the detail of the Phantom is supreme. This extends directly to the treble stage of the IEM. Thanks to the high level of tuning, there are no interferences that may lead to slightest level of fuzziness or uncleanlinesses. Mids. The signature of the Phantom is mid-centric. This makes this part of the spectrum the strength of the IEM. While the lower mids are extremely wide in stage, the spectrum on the stock cable shows a trapezoidal shape, with a stage narrowing down towards the upper mids. This trapezoid can be converted into a rectangle with a different choice of cable, leading to an evenly wide extension of the treble as described above. The center of the mids is the part that is affected least by a change of hardware, always maintaining a great and natural stage width. However, a change in cable can affect the cleanliness of the mids: indeed, resolution and detail benefits greatly from outbalancing the slightly dark signature. The lower mids are where the Phantom unleashes its full potential. The combination of timber with the strong and responsive upper bass reproduces instrumentals that amaze. Consequently, both epic classical music with rumbling and slow sounds, as well has fast metal base drums sound perfect, without any hint of delay or overlap in notes. This punchy and well-controlled sound is supported also by the separation and resolution of the sound. 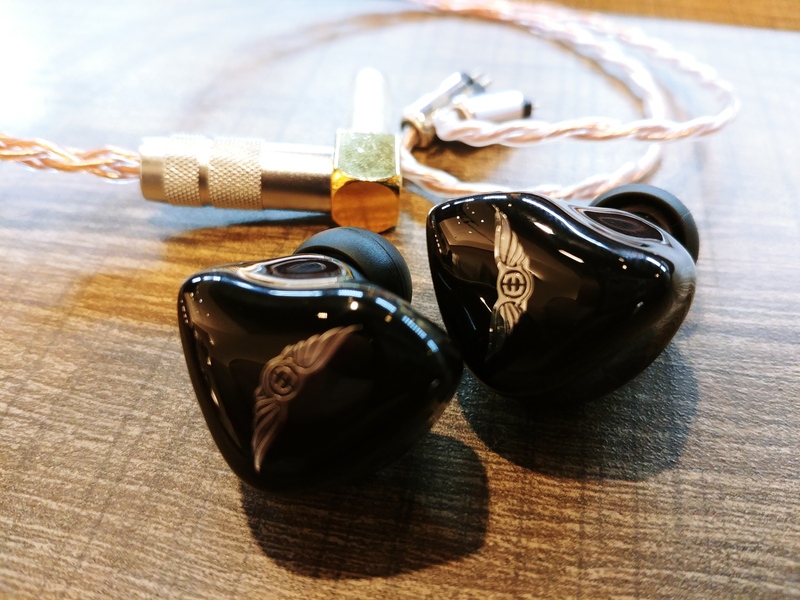 Here, the Phantom is among the best on the market, considering that usually warm in-ears have difficulties to achieve such a high level of separation and resolution. In between every note there is a short period in which the dark and noiseless background separates cleanly from the following one. Just as for the treble, the detail is stably kept at a very high level, yielding an extremely realistic sound: even the finest details are fully audible. Bass. With a lower-mid centricity, the Phantom presents an impressive bass stage. The two BAs achieve a huge body that fully realizes its potential: loud rumbling and quaking in classical pieces transmit the intimidating atmosphere intended by the composer, heavy metal bass and base drums reproduce the power and agility of the music and electric music features uber clean, punchy and sharp bass kicks and build up a tremendous amount of pressure that resonate the ear drum. The combination of high resolution, detail and separation are the reason for the extreme cleanliness of the bass stage. This in turn is a key ingredient to the strongly forgiving sound of the Phantom. Even bad recordings can be resolved and separated sufficiently well to make it a pleasant listening experience. If you like a heavy bass, the Phantom will definitely meet your expectations. To my mind, the bass is too powerful in the standard configuration with the Ares II, overwhelming parts of the upper mids and treble. For that reason, also here a cable with silver parts is beneficial in order to achieve a more balanced and open sound. However, this is where things are getting more involved. It is possible to find a balance between a bass that is still strong and features the abovementioned characteristics. However, as discussed in the next section, if the pairing is too powerful and the bass gets attenuated too much, then all of the sudden the Phantom tilts over and loses the strongest part of its characteristics. In short, the Phantom is an impressively tuned IEM that unleashes its full capability with the right hardware. In the following section I will elaborate more on one part of the hardware, namely cable pairings. The Phantom is a very adaptive IEM. A change in cable can make a whole lot of a difference, but also harm the signature. 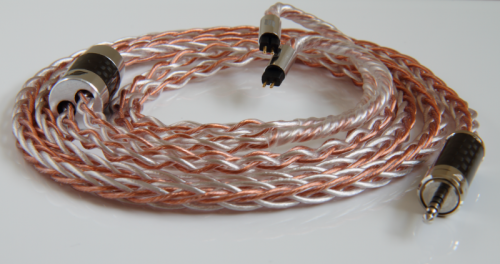 The stock cable is the Effect audio Ares II, which is a 4-braid copper cable. With the Phantom being a warm IEM on itself, this combination liquifies the sound more and makes it even warmer, which may not sound good anymore if your source is on the warmer side as well. In my case, it took me quite some effort to tune the Plenue S properly to have a pleasant sound image. One way around was using a slightly colder cable. I ended up picking a silver – gold plated copper hybrid to maintain the timber and punchy bass, while giving more emphasis to the mid and higher mids though the silver parts. This made a whole world of a change: the stage grew by a good 20-30% and the treble was way more open and sparkly. 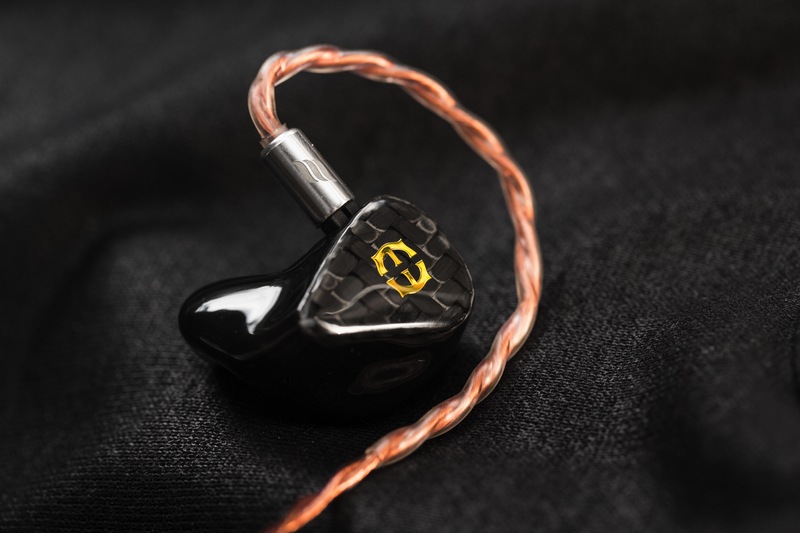 Concerning the listening experience, I found it essential to open up the higher notes, unleashing the full potential of the IEM and adapting the slightly dark signature in the stock cable configuration. However, a cable that is too cold does not work either: when pairing a pure silver or gold plated silver cable, the warm bassy signature is greatly reduced and the timber, which contributes a great part to the Phantoms sound signature, vanishes almost completely. This harms the signature quite a lot, leading to an unbalanced sound that lost its strongest parts. Hence, achieving the delicate balance of preserving the bass and timber, while shifting the spectrum more to the higher mids and opening up the treble is, to me, essential. In the following, I will mention three cable pairings that visualize more the arguments above. Ares II (Stock cable). The cable the Phantom comes with is a quite prominent, and surprising one. The Ares II is one of the respected copper cables on the market and positioned at the entry-level of premium upgrade cables. With its warm signature, it boosts the Phantom to a level that can only be driven properly by a colder DAP, such as the SP1000. On the WM1Z and the Plenue S, this pairing gives a “too much” of an impression. Irrespective of the audio source, I recommend to upgrade the cable to gain more stage and resolution. For example, if the temperature of the sound should be maintained, then PW audio or the Rhapsodio copper wizard do a good job. MadCable ReMSG. My personal choice became the MadCable ReMSG. It is an 8-braid silver – gold plated copper hybrid that finds the perfect balance between maintaining bass and timber, and opening up the higher mids and treble. Besides brightening the treble, the ReMSG keeps the bass responsive and punchy. Furthermore, it increases resolution and detail by a significant amount, pushing the Phantom to show its full repertoire of technical capabilities. Plussound X8 GPS. 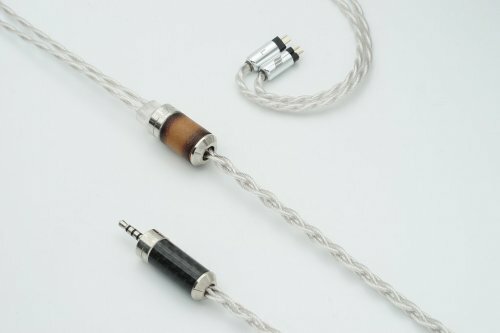 One instructive example of an unsuccessful pairing for me was the gold-plated silver cable by Plussound. The cable itself is amazing, and I cannot think of replacing it on my FitEar 335. However, the sound becomes too bright for the Phantom and loses its organic sound. The spectrum becomes upper mid-centric, with attenuated bass. However, the Phantom was not designed to be a bright, probably reference-sounding monitor, such that the combination simply sounds off. Even with my warm Plenue S, the cable was too bright. The same arguments count for other bright players on the market, such as the Labkable Titan or Pandora. Finally, from my personal point of view, I can recommend any good silver – copper hybrids in case that your DAP has a warm signature. One possible choice here is the aforementioned MadCable ReMSG. In case your audio source is on the colder side, I suggest a copper or gold plated copper upgrade cable, such as the Plussound X8. Before concluding this review, I briefly compare the Phantom it to the previous flagship, the Zeus R ADEL. The reason why I chose this comparison is that I assume many of you, including my previous self, are wondering whether the upgrade makes sense, given the strong performance of and high price for the Zeus R. My full review of the Zeus XR ADEL can be found here. Furthermore, numerous other reviews have already spoken about the difference between the Phantom and the Legend-X, such that I comfortably refer to them. The pictures attached below show the Zeus XR ADEL (on the left) in comparison to the Phantom. The Zeus R ADEL is a higher mid-centric IEM with reference sound. The stage is extremely wide, slightly diluted and laid back. This gives the Zeus R ADEL a stage that is wider than the one of the Phantom, by about 20 %. Yet, the density in notes is considerably reduced, which gives a clean but less engaging sound compared to the Phantom. The widely spread out of notes allow for excellent separation, slightly better than the Phantom. However, when looking at resolution and detail, the Zeus R ADEL cannot compete. The 14 drivers have excellent tuning, but compared to the black background of the Phantom, and the sharper edges of its notes, the Zeus R ADEL appears to have some slight but constantly present noise in the background. Overall, the Phantom presents a cleaner and more accurate sound image that has a more natural and powerful tonality. For me, I would redo the upgrade from the Zeus to the Phantom again at any time. The Phantom simply feels more sophisticated and separates itself from previous lines with the outstanding tuning described in an earlier section. 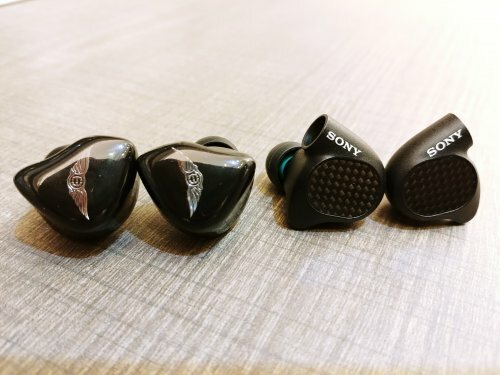 Putting aside a 2750 USD IEM for a newer, considerably cheaper one felt odd at first but there is definitely a lot to gain from changing to the Phantom, at least according to my preference. Empire Ears created a new flagship that takes the listening experience to the next level. While cutting down on unnecessary gimmicks, such as large amounts of drivers, the goal was rather to focus on a top-notch tuning. The result is a technically highly refined IEM that offers a combination of wide, strongly resolved, detailed and accurate sound, while maintaining a warm signature with a full-bodied bass. Its top-notch tuning achieves to keep up with the strengths of previous flagships, such as the Zeus, while improving their subtle weaknesses. With a reduced size, the Phantom also upgrades in wearability: the five BA drivers offer a light and small unit which. Its flexibility in sound allows the user to pair the Phantom arbitrary audio sources, given the appropriate cable to balance out too warm or bright sound. Overall, the Phantom offers an experience that knows to enchant the listener, with a natural sound that takes you right to the live stage. 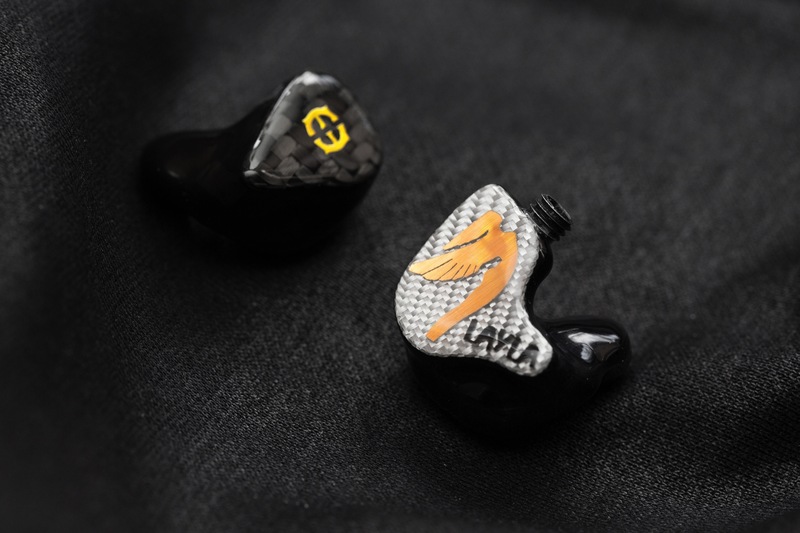 With a price tag of below 1799 USD, the price is more than fair and positioned in the lower mid range of high end in-ears. fiascogarcia, flinkenick, kubig123 and 5 others like this. I would like to thank Jack Vang of Empire Ears for providing me with a discount in exchange for my honest opinion. No incentive was given for a favourable review. My relationship with the Phantom has, for reasons I won't dwell on, been somewhat tumultuous, but finally I found a real sense of contentment in having found IEMs with a signature that suits me to a tee. The last aspect is what this review is all about and why this preamble is, more than in any of my previous reviews, a true, or perhaps 'stereotypical', example of an audiophile's motivation for voraciously seeking to hear every new IEM (or headphone, or speaker) that is released. The saying "Welcome to Head-Fi, sorry about your wallet." might be a running joke, but at the heart of it is a realisation that this hobby is a thoroughly addictive affair and it soon becomes a vice for many who frequent the Head-Fi forums. What then if I told you that I managed to turn this vice into virtue? Would that be the proverbial Holy Grail to Head-Fi'ers the world over? A genuine reason to say to your loved one... "But honey, these here TOTL IEMs are an investment in my health and wellbeing!" Well, perhaps that might be setting the bar a little too high, but music therapy is gaining more recognition and my own working hypothesis is that the benefits become greater, the better the music fits personal preferences. So my audiophile journey has always been about exploring what makes music engaging and finding ways to optimise how immersive my music can be because I gain genuine benefits from it. In my case it helps me manage my ADHD on a day-to-day basis. I will spare you the technical details, but there are genuine neurophysiological reasons for why this is, and it can work for everyone. Where it has become clear to me that different IEMs can tailor optimally to different types of music ("But honey, I need multiple IEMs for my health and wellbeing! "), my primary focus has been on timbre and coherency. My main TOTL IEMs therefore needed to ooze naturalness with realistic sounding instruments. Several options made my wish list, such as the Ultimate Ears UE18+ Pro, Unique Melody Maestro V2, Warbler Prelude and Spiral Ear 5-Way Ultimate. However, when I heard about the Phantom I knew straight away that these were tuned with coherency and timbre as a top priority and I understood they were aiming squarely at becoming the new benchmark for technical performance. How could I resist?! That said, this expectation of course set the bar very high for the Phantom and me going for these instead of the alternatives meant they had a lot to live up to. So let's see if they did, or if all my hopes for musical ecstasy were crushed. After all, I am putting my health and wellbeing on the line here. The Phantom have a very nice ergonomic shape that I think will work exceptionally well for many people. They are also very light, a friend of mine even suggested they might float away if thrown in the air, and that makes for a very comfortable fit. I am however not entirely confident in the design choice here. When my Phantom arrived, they unfortunately had hairline cracks in the finishing layer. While this could have happened for a number of reasons and Empire Ears assured me it was nothing structural (and fixed it of course!) it did make me a little uneasy. In fact, I noticed that I subconsciously started treating these differently from my other IEMs, babying them and storing them separately. Not in the case that I got from Empire Ears, which I felt was not optimally sized for universals with tips and an aftermarket cable, but in a Peli 1010 case. I think that Empire Ears aimed for a lightweight and comfortable design, which I am sure many people will love, but I personally prefer a more rugged design. For instance, when I reviewed the 64 Audio U6 I read comments from people criticising the design, but I loved it because it was simple and clearly built with stage use in mind. Similarly, after I auditioned the Vision Ears line up and wrote my impressions, I added an "honourable mention" for the build quality of the demo units, which felt rock solid and very similar to the UE18+ Pro. 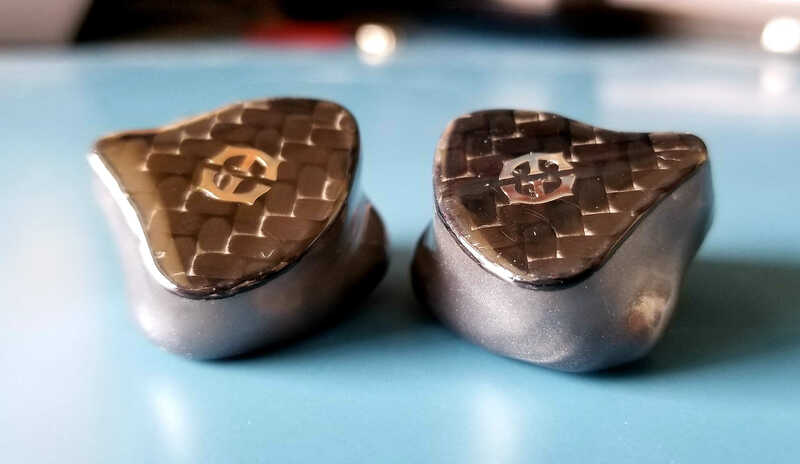 My most recently reviewed IEMs, the Rhapsodio Zombie, are the same price as the Phantom but in a different league altogether when it comes to build quality. Sure they are heavy, but they are also capable of surviving the most intense use with ease. Perhaps I worry a bit too much because my view has been tainted by the cracks upon receiving them, but irrespective of that I just prefer a rugged build quality over this lightweight and more refined design. Where Empire Ears scores full marks in my book though, is in the choice of cable. Finally! TOTL IEMs with a truly high quality, ergonomic stock cable. 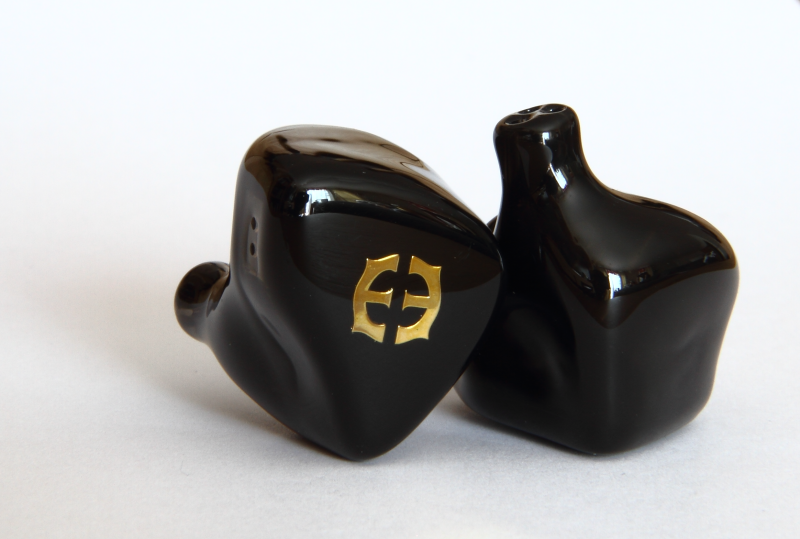 Not only that, but all Empire Ears IEMs now benefit from coming stock with the excellent Effect Audio Ares II. Great choice Empire Ears! All listening was done with my AK70 from balanced out. 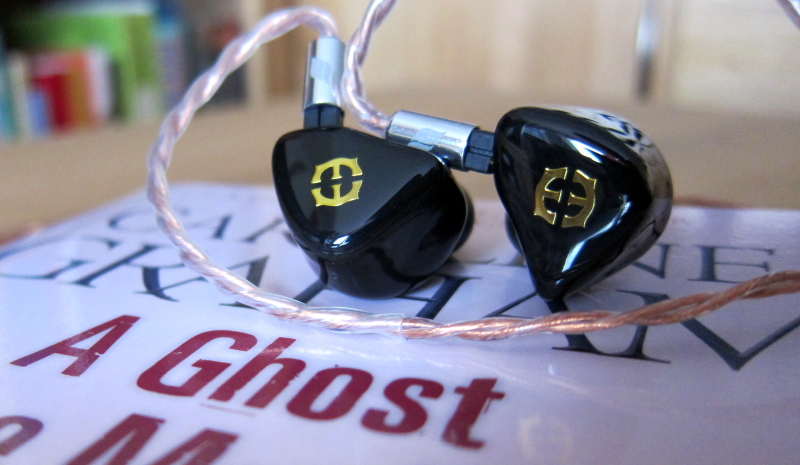 The Phantom are quite possibly the most beautifully balanced IEMs I have heard to date. I don't mean that in a reference sense, although I think they can probably be used as reference monitors, but rather in how instruments are balanced. While working on this review I spent a lot of time listening to classical music and Beethoven's 5th most of all. The image the Phantom present is absolutely superb and instruments layer in they way I had hoped they would, given what I knew about their tuning beforehand. Theory is great, but I have usually found IEMs to sound different from expected and in some ways the Phantom do that too, yet the end result is exactly what I had been looking for. The Phantom have a wonderfully holographic stage with the best sense of depth and one of the most stable images I have heard so far. They are warm and upon first listen warmer than I expected. Yet the more I listened, the more I noticed how well each section of the orchestra was balanced. It is dynamic warmth, dictated by the instruments themselves. The bass section adds impact and warmth, violins and cymbals (etc) add air and sparkle at the high end, while in between sits an astonishingly good midrange. This is not just superbly balanced based on each frequency coming through with an accurate and natural amount of presence, but also because the tonality at every point is spot on. Each instrument, in every range, playing any note, sounds, to my ears damn near perfect. And this is why I listened so much to Beethoven's 5th. By now I know Beethoven's 5th better than any piece of music. I especially know John Eliot Gardiner's interpretation very well and it allows me to illustrate what the Phantom's qualities do for me. The 5th is a revolutionary journey expressed through music and Gardiner used period instruments to create more layering in the performance, modern instruments sounding too thick in his opinion. With all the IEMs I have heard so far this difference between the instruments has been implicit for me. I knew it to be so because Gardiner explained it in an interview and I could sense it when I was comparing his 5th to that of (for instance) Simon Rattle, but I felt none of the IEMs I tried could accurately convey the difference. The Phantom can do that. So much so that it left me with a renewed appreciation for the incredible skills required for conducting classical symphonies. Let me take you on this revolutionary journey... The 5th consists of four movements. In the first movement Beethoven sets out his revolutionary ideals with bold statements expressed through the universally recognised four opening notes. Gardiner injects pace here, conducting at 108 bpm, and the Phantom present the notes resonant and impactful, just as you expect from a passionate statement: The bold sounding tympani, the dramatic brass instruments and sharp and precisely played notes. In the second movement Beethoven expresses his faith in our (human) ability to achieve those ideals. Everything slows down and starts to flow delicately, with instruments transitioning seamlessly from one to another and the Phantom clearly defining each instrument based on tone while maintaining the coherency and fluidity in the notes. In the third movement the revolutionary journey starts in earnest and brass instruments come up bold, uplifting and with intent. Occasionally the bass strings will give the impression of dispersion, only to fall back in line with equal intent. And then everything slows down again with delicate tones, beautifully presented against the pitch-black background of the Phantom. Only a few instruments come through, ever more silent until the drum roll starts and strings begin to increase the sense of anticipation until... La liberté! Freedom! In a burst of exuberance the tympani and brass instruments come back, accompanied by strings, woodwinds and goose bumps every time I listen to it with the Phantom. It is glorious, incredibly layered and flows like a key cinematic scene from an India Jones movie. Because of the accurate tonality, the coherency and outstanding layering, the sense of drama is the very best I have heard so far. This is where the qualities of the Phantom come through unmistakably. Moreover, this does not just work for classical music, but almost every other kind of music as well. The Phantom perform exceptionally well with Caro Emerald's 'Acoustic Sessions', one of my favourite albums with the Phantom, and they will do Indie Rock, Jazz, Blues, pretty much everything you can throw at them. Any weak areas? Perhaps something like EDM, where I prefer more energetic, bass-heavy IEMs. The Phantom's bass is, like every other aspect of their signature, a beautiful balancing act. It is an extended bass and the track 'Polyrytmi' by Carbon Based Lifeforms makes that very clear by stepwise going lower down to a rumble and the Phantom follow that with ease, but the Phantom also exercise restraint. There is a beautiful natural resonance to bass instruments like the cello and double bass that I consider to be very accurate and I can hear the resonance in the body of the instrument. It is not just a warm sound, it genuinely sounds like I am listening to a large, resonant instrument. It is what I love so much when I listen to Caro Emerald, where the double bass is perfectly placed. The mid-bass might however, to some people, be lacking a little bit. Because I am a bass-head I do on occasion feel I prefer a darker signature, for instance with the Rolling Stones, where I prefer the "smoke-filled blues bar"-type atmosphere that bass-heavy IEMs like the (slightly bonkers) Rhapsodio Zombie create. Still, this is really just a matter of preference and I would not want the Phantom to be any different because any more mid-bass and it would upset the balance for classical and other types of acoustic music. There is enough bass presence for instruments to have the right level of natural resonance that is inherent to them and the sub-bass extension adds excitement to ensure musicality. In fact, I was really surprised by how well the Phantom did with genres such as metal, like for instance Disturbed, where drums were impactful and added a real sense of energy. It was like the music transformed the Phantom from Jekyll into Hyde. Oh these mids... So good... (Insert image of Homer Simpson drooling.) I am a huge lover of great mids and vocals, and for that reason the Vision Ears VE5 have been among my very favourite IEMs. I think the Phantom's mids rival those of the VE5, but I unfortunately could not compare the two because I do not have the VE5 at hand anymore. The Phantom have very clear mids with a hint of warmth. It takes some getting used to, as the strengths of the mids are not readily apparent. The Phantom are not bright detail monsters, but you are doubly rewarded when listening attentively with an exceptionally natural sounding mid-range. The balance between female and male vocals is just about perfect. When I listen to Beethoven's Missa Solemnis or Mozart's Requiem, which are performed with large choirs, the separation and layering of the voices is incredibly good with male voices having a good deal of authority, while female vocals come through crystal clear. A little birdy explained to me beforehand that the Phantom were tuned to have "perfectly balanced" vocals and the more I listen to them, the more I tend to agree with that. Especially with intimate vocal music such as Agnes Obel, Madeleine Peyroux and London Grammar, I was impressed by how natural it sounded. Strong, well defined and crystal clear. Yet at the other end of the spectrum, David Draiman's characteristic voice (which is anything but clean) easily took centre stage in the midst of all the violence of drums and electric guitars in Disturbed's (aptly named for this section) "Voices". The Phantom really impressed me by how much they managed to capture the energy and emotion in that voice. Mid-range instruments of course sound exceptional because of their accurate timbre and this is why the Phantom work so wonderfully well for classical music. To be able to distinguish similarly sounding instruments with ease, based purely on tonality is such a big deal in conveying the emotions of a piece. To borrow a term from photography, it was like the Phantom have a higher dynamic range in terms of tonality. It is so easy to follow the sometimes very subtle tonal fluctuations in classical music, where the tone ebbs and flows along similar sounding instruments. The treble is incredibly well extended and a bit attenuated overall, an important way to create the natural tonality and outstanding resolution. For me this treble is spot on, but I will add that I have changed the tips from Final Audio with other, full silicone tips to take away some of the edge that the Final tips can cause in the treble. I have also switched the cable from SE to balanced out, which on the AK70 is a little more laid-back in the treble. The result is a very smooth, sparkly and at times almost ethereal treble. Cymbals in rock or metal are clearly heard and well placed, but might for some people feel a little polite. However, brass instruments and any type of string instrument (violin, guitar, etc) in acoustic music come through with a little bite that I think works incredibly well. A brass instrument has to have that sort of authority to be able to rise above the other instruments, any more laid-back and the tonality of these instruments would be adversely affected. In my opinion synergy is key to getting the most out of aftermarket cables and this is regardless of price. Case in point is Lionheart, which is my favourite cable and was the one I was looking for most of all to try out. This unfortunately turned into somewhat of a disappointment, as Lionheart simply did not synergise as well as I had expected. Don't get me wrong, the sound was very nice, but it departed too much from the Phantom's main strength; their tonality. I felt this was in particular the case for brass instruments and strings, as I just explained in the treble section. It is just a little too laid back. Otherwise the pairing was a little more airy and wonderfully easy-going to listen to. Great, but not optimal. Edit: I recently returned to the pairing with Lionheart because I knew that sometimes synergy with the balanced out of my AK70 can be less than ideal and it turned out that this was the case here as well. Using an adapter by Astrotec, I paired the Phantom with Lionheart from SE out and the result is absolutely gorgeous. It goes from "great, but not optimal" to "blimey! I can't stop listening"-awesomeness. Where I think Lionheart really scores exceptionally well is with strings. It adds a wonderful bite to the strings, which sound sharper and more detailed to the point that when I listen to Paganini's Concerto No.4 (my new addiction) I can hear the tension of the strings and the acrobatics of the bow on those strings. From legato to spiccato and from tremolo to jeté, Lionheart presents the techniques with astonishing clarity, detail and a brightness that is so incredibly good when techniques are used that produce an icy and eerie high tone, providing spine-tingling pleasure as I listen to Saint-Saëns' Danse Macabre. It has the same effect at the other end of the frequency range and cellos sound detailed and with a beautiful resonance in the body of the cello, resulting in a slightly less weighty, yet still more realistic sounding cello. Overall I love the added texture that comes through and the gorgeous liquidity that I feel is so unique to Lionheart. Another surprise was the Exo Silver + Gold, which I would not rank among the most natural sounding cables (they were never intended for that either, so makes sense). Yet the pairing with the Phantom was really very nice. I liked it a lot. The Exo added brightness and air, extended the stage and yet instruments still sounded very natural. Not quite as good as with Ares II, but the resulting presentation was especially enjoyable for classical music. The Exo's added brightness helped details come through more easily and I felt violins got a little more prominence within the presentation of symphonies and sounded absolutely amazing solo (I love violins). This pairing, in my opinion, hits a sweet spot for classical music and the 8-wire has become permanently affixed to my Phantom. It makes everything sound grand, which works wonders for classical symphonies. The 8-wire adds tons of air, pushes the mid-range slightly further forward and maintains the tonality of the 4-wire. Vocals sound eerily realistic at times and while I might have a slight preference for the 4-wire when it comes to more intimate music such as jazz, the 8-wire makes the Phantom sound more like full-size headphones and it is glorious. Apart from some concerns about the lightweight build quality and practical issues with the size of the case, the Empire Ears Phantom are very worthy of the moniker "TOTL". 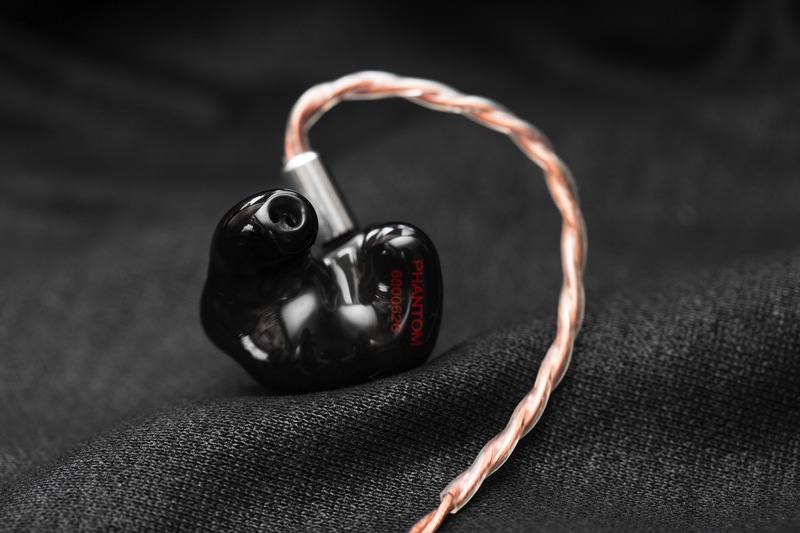 The Phantom are exceptional technical performers that offer accurate timbre, reproducing some of the most realistic instruments and vocals you are likely to hear from any IEM at any price point. They might not be for everyone, as their focus on timbre and coherency means they are not exciting detail monsters, but for anyone who prioritises accuracy, these should definitely be on your demo shortlist. tunes, hifilover1, ryanjsoo and 25 others like this. Could you do a quick comparison on these and andromedas? Thanks for the review, was looking for one for quite some time. Thanks @Audiophonicalistic Unfortunately I don't have the Andromeda and have never been able to find a place to demo them here in the UK (I have looked because I was interested in those as well), so I have not even heard them.